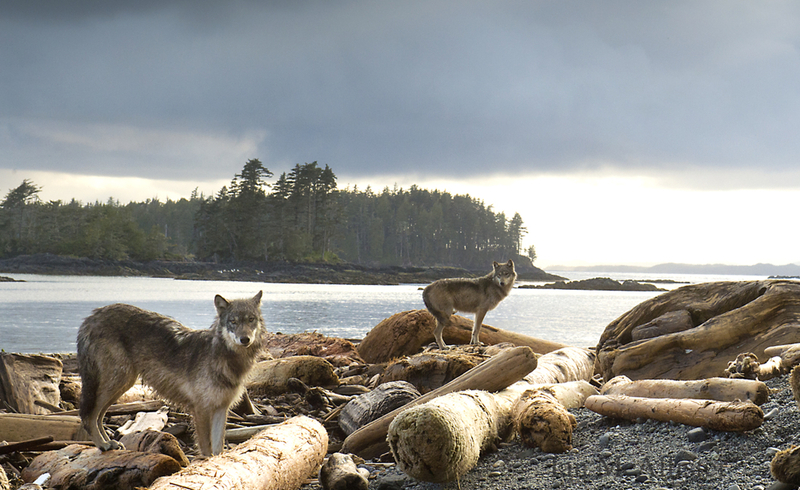 Sea wolves of the rainforest swim from island to island hunting seals and sea lions. Only a week ago, the chatter of wrens, the rhapsodic thrushes, and the soft splash of a salmon tail were the ambient signatures of this rainforest alcove. Everything now is replaced by water—lots of water. A torrent falls from the sky, rushing across beds of moss as the river spills over and through the forest understory. Nothing escapes saturation. Record-breaking rain hammers the coast. It is the end of September and already we have endured four separate storm events, characterized by winds exceeding sixty knots. Long-time mariners tell me they have recorded the strongest winds on their boats’ ane- mometers in over fifty years. This kind of weather makes hard work for everyone, whether you’re a bear fishing for salmon or a captain trying to keep your boat and crew safe. Octopus and bat stars. 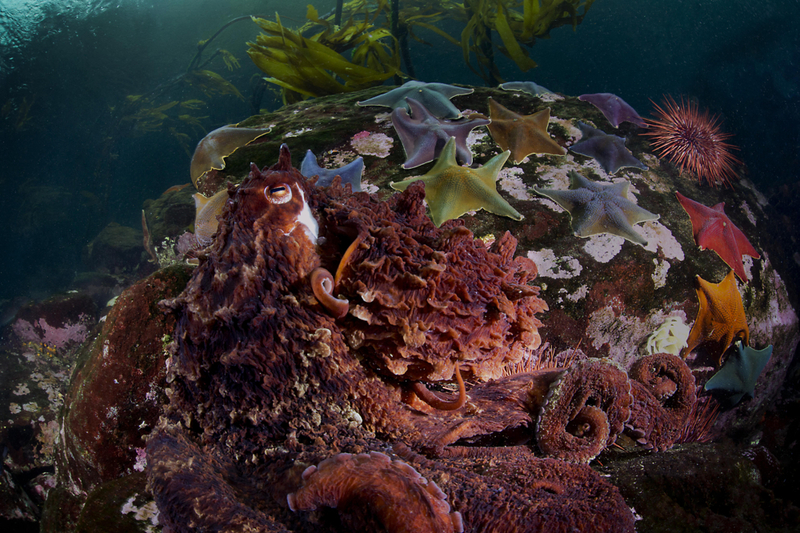 Canada has the longest coast line on the planet and ranks among the last in marine protected areas. Photo by Ian McAllister, Copyright 2014. The canyon has filled with spray and mist. The bears below are having a tough time keeping track of one another; normally scent is their navigation tool, but the pouring rains, unpredictable gusts, and loud rushing sound put them at a disadvantage. These bears couldn’t even hear a shotgun blast from across the river. This is an old and well- established fishing spot, and for some of these bears, many of the most important days of their lives have been spent here. Coming here feels like traveling back in time; all thoughts of oil pipelines and tankers that increasingly consume the coastal conversation these days seem distant. The fresh smell of salmon, blood, and ripped flesh comes in chaotic waves with the mist, but I choose to stay higher up. The chance of disturbing a bear in the close confines of the canyon bottom is too great, so I wait above on the cliff’s edge. Like the many carnivores around me I also feel sensory deprivation. The noise makes me feel like I’m underwater— there would be no warning of an animal’s sudden appearance beside me. 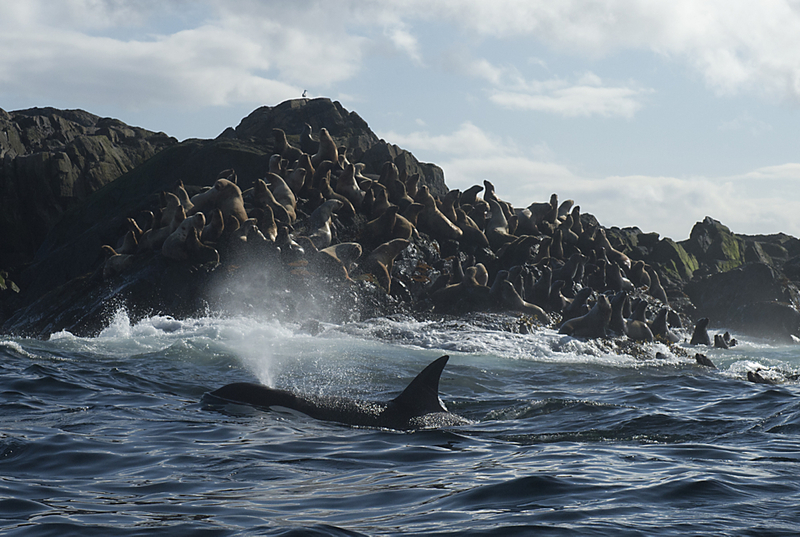 When salmon return in strong numbers like this it has a calming effect on coastal inhabitants, human and non-human alike. A level of accommodation is being displayed between everyone in the canyon that normally would not be observed during other seasons. But the uncertainty of who, and what, is in the canyon, mixed in with my scent, creates a charged environment. 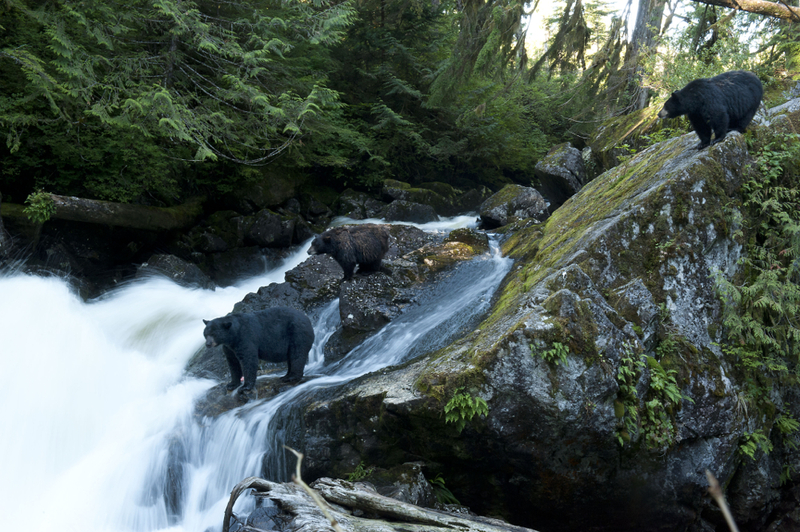 There are only so many good fishing spots in these fast-moving island creeks, where bears, wolves, salmon, and a host of others are forced to meet. Today is a day to be patient. If you are going to see things here you often have to wait quietly for quite a while and let things unfold in their own time. When I first arrived I didn’t actually see any animals. But that’s normal, and I suppose a bit like being in a seemingly empty neighbourhood in an unfamiliar city. Minutes might go by in which nothing happens. If you leave, you might report that the place is void of life. But if you wait, a door might open, and people and their routines will soon become visible. But bear signs are everywhere: The trees are worn, varnished from hundreds of gener- ations of bears sliding up and down as their mothers fish for salmon, a kind of arboreal ursine daycare. Down below, the occasional coho has a deep red mark on its back, a badge of honor for having escaped a whale, bear, wolf, seal, or net, though there are many more mouths to avoid before this spawn has played out. The fish move through the river with heroic purpose, but the bears feel the anxiety of never knowing how large the salmon run will be and how long it will last. Bears furrow their brows like humans do when they are concerned. Soon a bear comes out of a corner of the rapids, grabs a fish, and is replaced by another. Looking down through the occasional breaks in the spray and mist, I can see hundreds of black salmon heads and tails rising occasionally above the swirling foam. Large house- sized boulders fill the tight gorge, forcing salmon to swim through fast-moving tunnels below. It is a coho salmon bottleneck. A fishing derby is not far off. Downriver, the early run of pinks is mostly spawned out, and I see a small bear stand up on its hind legs to access some crabapples. The sharp tartness must be a nice respite from the decaying corpses floating downriver. When I passed those swimming carcasses earlier in the day some of them were moving and technically were alive, but their souls appeared to have since departed, their bodies unable to shut down after such a constant journey. I first came to this spot over twenty years ago and have not missed a salmon season yet. Even by Great Bear Rainforest standards this place is remote, hidden among a sea of unbroken rainforest, wild creeks, islands, and mist-cloaked fjords. Down at the end of the main creekside bear trail, near the ocean, the entrance to this particular watershed is deceiving. It appears to be just like any one of the countless creeks emerging from the rainforest edge, but there is nothing typical or usual about this place. Being one of the few strong salmon runs for many kilometers, this river attracts a disproportionate amount of wildlife that come for the salmon, or predators that come for the salmon eaters. Last year Karen and I brought our children here for the first time. It was a rich day, watching our small ones scampering about under such large and ancient trees, hearing their chatter and laughter as the ravens bounced along curiously above. I suspect that it had been many generations of ravens since the sound of young children’s laughter had been heard so near the headwaters of this valley. Dates for fall events in the Pacific Northwest and Alberta, for Ian McAllister’s talks about this project, are here.